The Resurrection of Christ from the dead is – by any measure – an astonishing, supernatural event and lends itself to dramatic flights of imagination. Though no one saw it occur, artists have been drawn to its melodramatic potential, as was Rembrandt in one of a series on the Passion of Christ, made ca. 1635-39 for the Dutch stadtholder, Prince Frederik Hendrik. However, from the gospel accounts it is evident that Christ himself eschewed the sensational, first showing himself after his resurrection in the guise of a gardener to Mary Magdalene. That same evening, he joined two of his disciples as a fellow traveler on the road to Emmaus as they walked and talked over the events of the past few days. So unassuming was his appearance, they did not even recognize him. It was only as he broke bread at supper, blessed, and then gave it to them, that their eyes were opened and they recognized him. He then immediately vanished out of their sight. According to the account in Luke 24:13-35 they then said to each other, ‘Did not our hearts burn within us while he talked to us on the road, while he opened to us the Scriptures?’ (v 32). 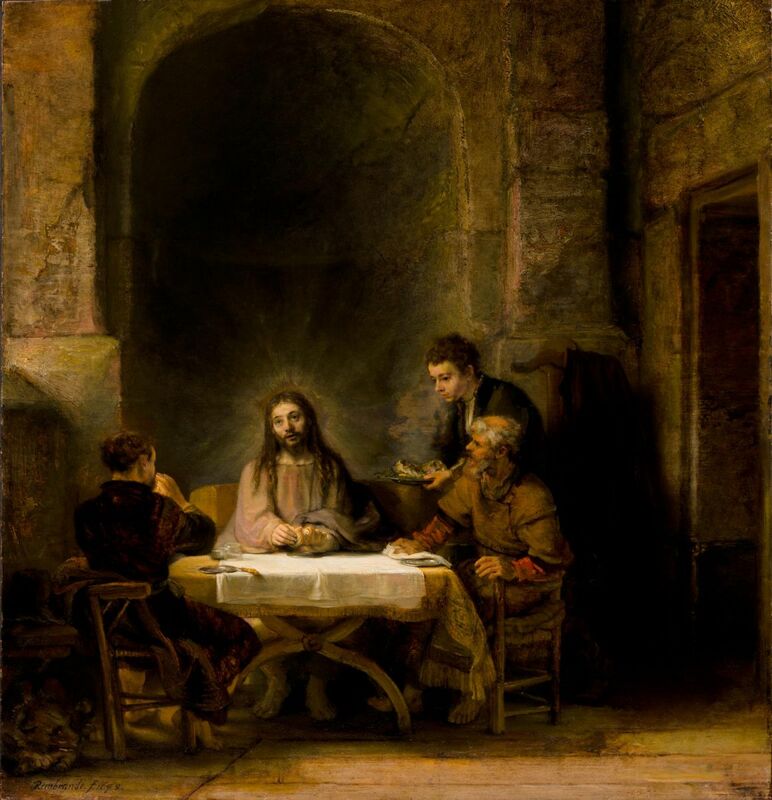 Rembrandt painted the Supper at Emmaus twice: both treat the wonder of Christ’s resurrection indirectly, but the contrast between them is telling. The first version was painted in 1629, about ten years before his rather melodramatic painting of Christ’s resurrection. The mood and meaning of the Supper at Emmaus are carried by its striking contrasts. His head thrust back awkwardly, Christ is seen in harsh silhouette against a burst of bright light, so revealing himself. The closer disciple having leaped up, toppling his stool, has fallen to his knees, while his companion across the table shrinks back in awe and wonder. 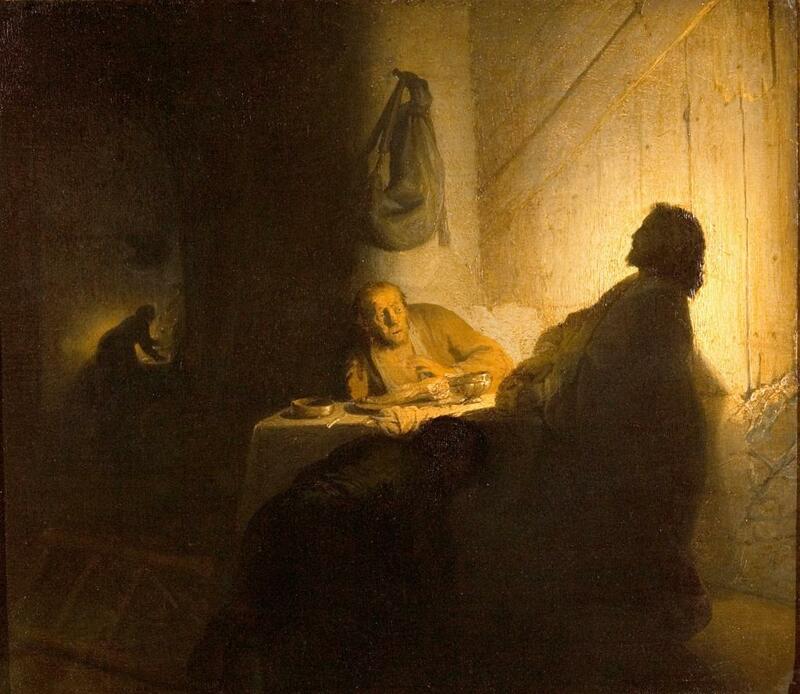 Almost twenty years later in his Supper at Emmaus of 1648 Rembrandt returned to this subject, again addressing the wonder of Christ’s resurrection indirectly, but this time treating it in a quieter and far more pensive manner. In this later painting the matured Rembrandt seems to have absorbed more of Christ’s own understated manner of self-revelation into his understanding and representation of the event. For his 1648 version of the Supper at Emmaus Rembrandt perhaps borrowed from a work by Titian the potential of the large, shadowy background alcove to evoke a pensive and reverential atmosphere. He lays much of the emphasis here in what is not seen, the thoughts of Christ’s disciples, as they begin to grasp who is at the table with them. As for the serving boy, he has not the slightest idea that anything notable is occurring, for the man breaking bread could just as well be a gardener or any other ordinary visitor to this wayside inn. It is also worth noting that the face of Rembrandt’s Christ departed from all historical precedents or idealized representations for depicting Christ and instead was based on studies he had made of an ordinary Jewish young man in Amsterdam. Surely Rembrandt was doing more than identifying Christ with his Jewish parentage, but rather emphasizing the reality, recorded in the gospels, that even his own brothers did not recognize him as the Son of God, nor did his appearance compel others to believe. It was his words and deeds that set him apart and it is on this that Rembrandt focuses our attention. In a setting designed to create atmosphere the light falls on Christ’s face and hands as well as on the table before him. He looks up towards heaven, he breaks bread, and speaks. Rembrandt surely counts on his viewer’s knowledge of the Bible, sufficient to suggest what came to the disciples’ minds: ‘Did not our hearts burn within us, while he opened to us the Scriptures?’ We too are left to marvel. 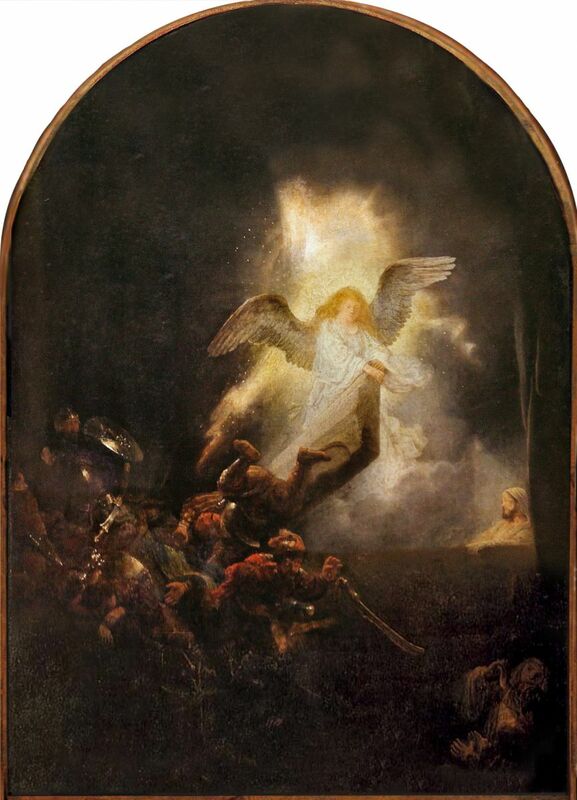 Rembrandt van Rijn, The Resurrection, ca. 1635-39, oil on canvas, 92 x 67 cm. Alte Pinakothek, Munich, Germany. Rembrandt van Rijn, The Supper at Emmaus, 1629, oil on paper, 39 x 42 cm. Musée Jacquemart-André, Paris, France. Rembrandt van Rijn, The Supper at Emmaus, 1648, oil on canvas, 68 x 65 cm. Musée du Louvre, Paris, France. Rembrandt van Rijn (Leiden 1606 – Amsterdam 1669) was a Dutch artist known for a lifetime of painting penetrating portraits and self-portraits, as well as perceptive and ever more pensive representations of Biblical subjects, both in etchings and oil paintings such as these. In the past some have questioned the authenticity of the 1648 Louvre painting, due to the careful finish of the still-life elements, since by around 1650 his works were becoming typically coarser in execution, but it is now widely and properly accepted as authentic. E. John Walford is a retired art historian, who used to teach at Wheaton College, Illinois, USA and is author of Jacob van Ruisdael and the Perception of Landscape (Yale University Press, 1991), and Great Themes in Art (Prentice-Hall, 2001).